The University of Oklahoma Athletics Department and Southwest Airlines® have announced that, weather conditions permitting, a special commercial airliner flyover will take place before Saturday's Bedlam game in Norman to honor a former OU football player whose life was cut short two weeks ago. Mike Winchester, a punter for the Sooners who lettered from 1984 through 1986 and was a member of OU's 1985 national championship team, was killed Nov. 15 outside Oklahoma City's Will Rogers World Airport, where he worked for Southwest Airlines for 29 years. A resident of Washington, Okla., he was 52. 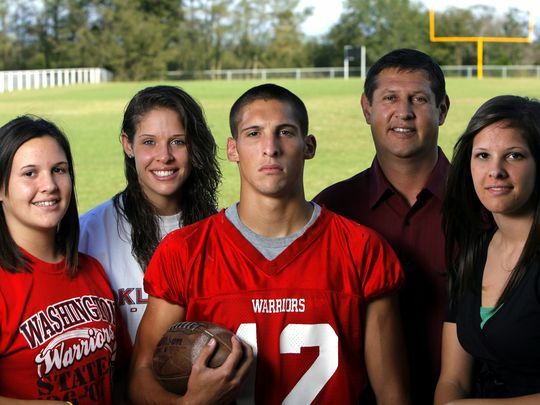 Winchester, whose son James also played football at OU (lettered 2009-11) and is a member of the Kansas City Chiefs, and whose daughters Carolyn (2006-09) and Rebecca (2010-13) competed on the OU women's basketball and rowing teams, respectively, is also survived by his wife Julie, daughters Emilyne and Kate, and son John. Emilyne will graduate from OU later this month. They will be joined by 13 additional family members on the field for a pregame moment of silence, the national anthem and flyover by a Southwest Airlines® Boeing 737 passenger jet.